Concordia’s women’s basketball team fought hard for most of the game, but hit the snooze button in the fourth quarter. 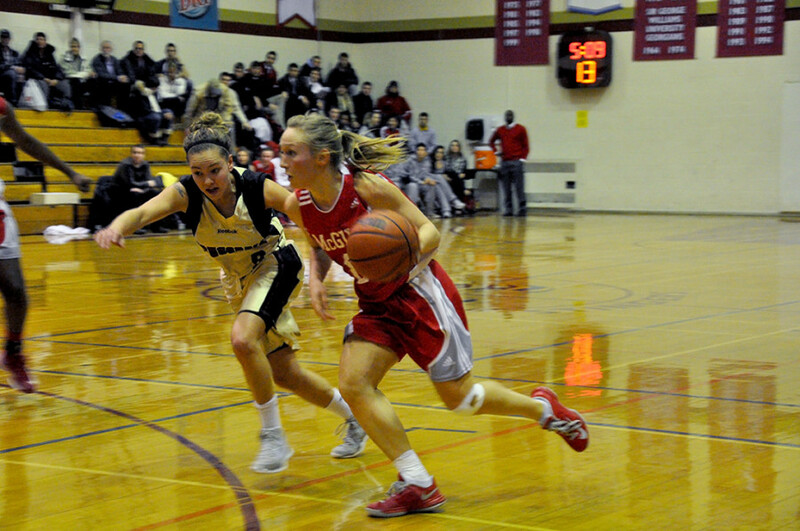 The McGill Martlets took advantage of this to ride all over the Stingers late in the game, as they left the Concordia Gym victorious in last Thursday’s matchup. The result left a sour taste in the mouth of Keith Pruden, head coach of the Stingers. “Our shooting percentages were very poor, and we just couldn’t put the ball in the basket,” he said, referring to the mere five shots the team made out of 30 attempts from the field-goal range and their one-for-16 performance from the three-point line. The Martlets got the ball rolling early, taking a 6-0 lead. Yet unlike the teams’ Jan. 10 meeting, the Stingers weren’t as rusty in this game. They played a close match, and even led at various points during the game, including at the 8:40 mark of the second quarter, when they were up 29-24. “We were playing good defense for the most part, and we were making more shots earlier,” said Pruden. Led by guard Kaylah Barrett and forward Marilyse Roy-Viau—who finished the game as the Maroon and Gold’s top two scorers, with 23 and 14 points respectively—ConU had McGill’s number through three quarters. Come the fourth quarter, though, it was as if the Stingers had lost their focus, as they found themselves simply unable to score. 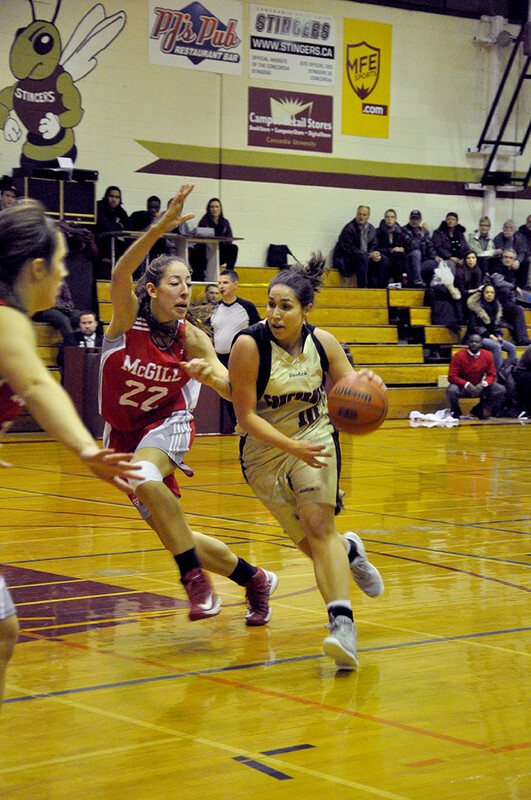 Meanwhile, the Martlets were distancing themselves further and further from their crosstown rivals with help strong efforts from forward Mariam Sylla and guard Marie-Pier Bastrash, who led the Martlets in scoring with 20 and 10 points respectively. And just like that, what was once a 44-all score had become a 60-46 defeat, leaving Pruden in disbelief. “We went cold off the beginning, and we just couldn’t buy a basket in the last 10 minutes,” he said. Following last Saturday night’s 74-70 win over the Université du Québec à Montréal, the Stingers now stand atop the Réseau du sport étudiant du Québec standings with a 7-3 record. 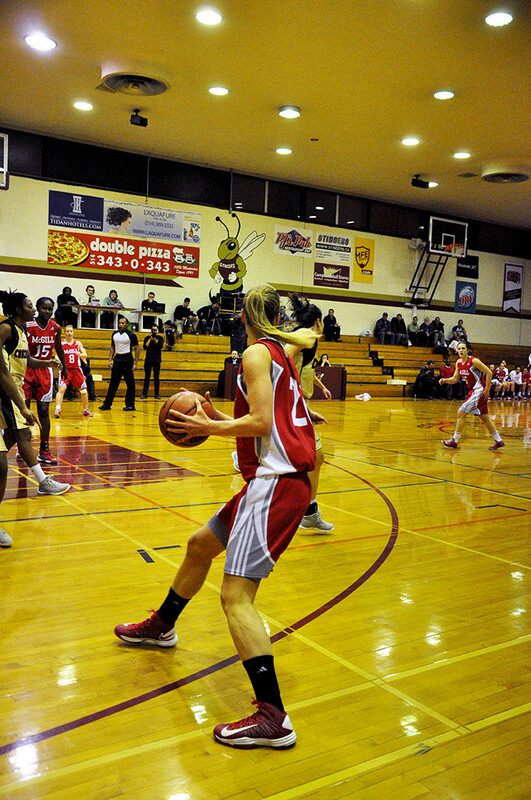 The Stingers will look to hold onto that top spot when they then travel to Love Competition Hall Friday night for a rematch against the second-place McGill Martlets. Tipoff is at 6:00 p.m.